The Bold and the Beautiful (B&B) spoilers for the week of November 13 reveal someone could be returning. 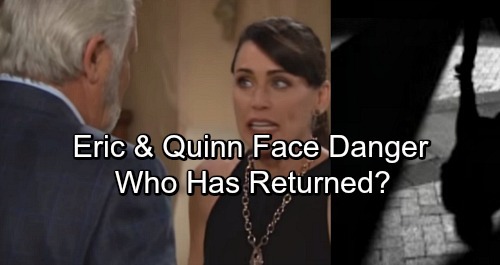 Will Eric (John McCook) and Quinn (Rena Sofer) be forced to deal with Sheila (Kimberlin Brown) again? Or will they face a new complication? Sheila Carter was a huge problem for Quinn on B&B. For a short time, it seemed like Eric Forrester was falling for the schemes. However, the tables were turned, and the obsessed woman was forced to leave. Before making her big exit, Sheila vowed that she would be back. The Bold and the Beautiful spoilers state that Eric and Quinn worry she has already returned. Is it true, or could the scary incident be from something… or someone else? The couple might just be assuming based on their recent experiences. But there might be a new type of trouble brewing. It is possible that Eric and Quinn’s scary incident could be related to someone new. The Bold and the Beautiful spoilers may lead fans to believe it is Sheila. However, it might be time for a new foe to come along and cause mischief. The perfect way to catch the couple (and fans) off guard is by misleading them. B&B spoilers hint to expect new faces, so this is definitely a possibility. Kimberlin Brown teased that shouldn’t count Sheila out just yet. However, she recently announced plans to run for Congress. This is a huge undertaking and it would take up most her time. Perhaps there is a way for her to do both. The Bold and the Beautiful buzz says that Kimberlin Brown was seen filming new episodes of B&B. To make things interesting, Sheila could be back, but will stay in the background. She could use someone else to do her dirty work. She did this once before with Mateo (Francisco San Martin). Even though that plan didn’t work out in her favor, Sheila could use a different pawn and a new approach. A natural candidate could be Sean Kanan in his role as Deacon Sharpe – as long as Sheila can get him released from prison. This would limit her screen time, which would allow the actress to enjoy the best of both worlds. Do you think Sheila is back already, or is there someone new causing problems for Eric and Quinn? Keep watching the CBS soap and check back with CDL for the latest in The Bold and the Beautiful spoilers, updates and news.